After some renovation and some new PCs, our development department moved into our new bullpen area a couple of weeks ago. It’s something like two or three times the size of the room we’d been in for the past year, and it’s very nearly designed to our specifications. Late last week, they finished installing what is perhaps the coolest feature of the bullpen: the Acres and Acres of Whiteboard (photos below). The bullpen is a fairly large, sorta-kinda-L-shaped area. 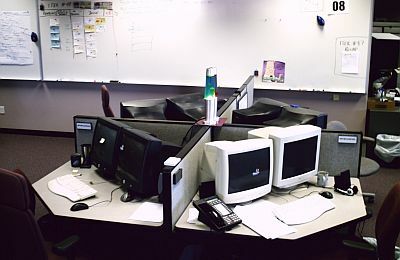 The QA staff have desks off to one side of the sorta-L, and there are tables and leftover cubicle furniture on the other leg. There are two programmer pods in the room, with a fair bit of space around and between them. That gives us eight computers for nine coders, which is plenty when we’re all pair-programming. 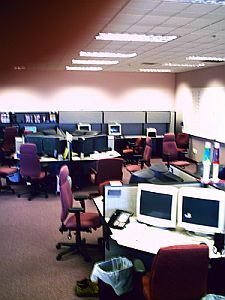 But the extra computers are great when people are checking their e-mail around lunchtime, or when one of the monitors is going bad. And it leaves the department some growing room, which is good since we’re hiring. Along the far wall there’s some more table space and some overhead bins. Our continuous-build machines currently live along that back wall; our new testing-lab PCs will go there as well. 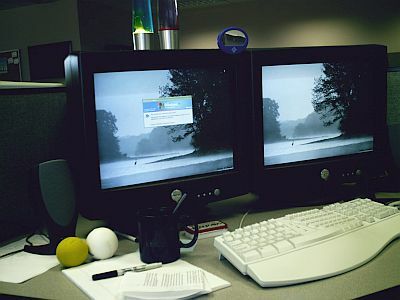 This is a close-up of a single pair station. Note the ergonomic split keyboard (unfortunately, not all the stations have these, as not all of our programmers like them), the few random papers, the foam balls to throw at people who get into overly-loud discussions, the mug of company-provided hot chocolate, and the box of Curiously Strong Mints. 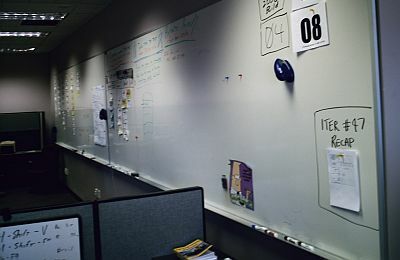 This is one of (and the more impressive of) our walls-fulla-whiteboards. All our whiteboards are five feet high (just take a minute to think about how big that is). This wall has two 16-foot-wide whiteboards side-by-side; the other whiteboard wall has a single 12-footer. In all, that means we have two hundred and ten square feet of whiteboardy goodness. That’s 0.0048 acres of whiteboard space. And the best part is, not only is it all whiteboard, it’s all magnetic. Foil-backed whiteboards, so you can write on ’em, and you can also stick stuff to ’em with magnets. 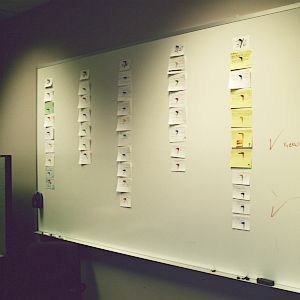 We use our twelve-foot whiteboard (not shown) for our current-iteration story cards; we stick the cards up with magnets, and then whoever’s working on a card will write their names next to it on the whiteboard. Pretty sweet. 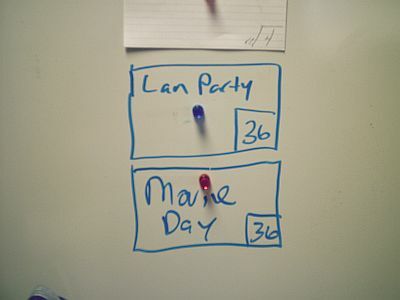 We use one of the sixteen-foot whiteboards for our release plan (one column for each week between now and our next release). The magnets come in very handy here, as our customers add cards and move others around as they go, based on an ever-improving (we all hope) understanding of what needs to go into the release.